St. Paul, Minn. — The Ah-Gwah-Ching Center, located about two miles south of downtown Walker, Minnesota, once was home to hundreds of tuberculosis patients who lived and worked on the property. Now a state-run psychiatric nursing home, the center faces closure and an uncertain future. The center opened in December 1907. Known then as the Minnesota Sanitorium for Consumptives, its primary purpose was to treat cases of tuberculosis. The facility was designed by state architect Clarence H. Johnston Sr., who also is known for creating the plans for many homes along St. Paul's historic Summit Ave. Originally meant to house 65 patients, by 1927 the facility had 300 patients, according to an article in the Walker Pilot newspaper. The facility still is licensed for 343 beds, but only staffs 155, according to the Minnesota Department of Human Services. 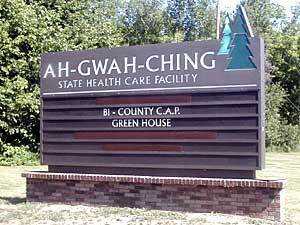 In June, says a DHS report, just 105 patients were housed at Aw-Gwah-Ching. In its early years, Aw-Gwah-Ching had its own post office, its own railroad depot and other facilities that helped it be self-sufficient, said Renee Geving, director of the Cass County Historical Museum. "They had their own farm, they had their own dairy herd," Geving said. A community hall in the 1920s served as a venue for skits and plays performed by staff and patients of the facility. Aw-Gwah-Ching also had its own newspaper, The Pine Knot, published from 1913-1924. During a three-year period beginning in 1928, Aw-Gwah-Ching participated in a bird-banding project, tagging 3,625 birds, Geving said, reading from a history of the facility. And in 1935, a prison camp was established there to handle overflow from the reformatory at St. Cloud. But perhaps the most impressive part of the center's history is its art collection. During the Depression, Geving said, lithographs, watercolors, wood sculptures and other art forms were created and put on display at Aw-Gwah-Ching as part of the Works Progress Administration's Federal Arts Project. "It's the largest WPA art collection in the state," Geving said. But the collection today is stored away. In 1962, Aw-Gwah-Ching was converted to a state-owned nursing home for people with "challenging behaviors," says the DHS. Added to the National Register of Historic Places in 2001, Aw-Gwah-Ching along with the state-owned treatment facilities in Fergus Falls and Willmar are among historic properties the Preservation Alliance of Minnesota says are most endangered. A total of 22 buildings are found on Aw-Gwah-Ching's 175 acres. Part of the property is along Leech Lake, which some preservationists have said might make the facility of interest to developers.